Let me preface this entry by saying, I’m not Japanese. Not one single solitary drop of Japanese blood in my veins, but in a way, I have a little bit of a Japanese heart. I grew up in Honolulu, where at one time, 43% of the population was of Japanese heritage, and that enormous nihongo presence in the islands managed to permeate the every day culture of Hawai’i. It is evident in the local patois – Pidgin English – where many of the words are bits of Japanese, the celebrations (Boys Day, Girls Day, Obon Festival), and last but definitely not least, the food. Chicken katsu, mochi, onigiri, pickled daikon – these are everyday food items available at your local grocery store or fast food restaurant. Without explaining the entire history of how it happened (it involves pineapple plantations), I’ll just say that Hawai’i became a huge melting pot of ethnic groups, and in some way or another, you end up taking traditions from so many different cultures that they become part of your own, with Japanese being one of the biggest influencers. And thus, o-zōni is one of my favorite New Year’s Day traditions. 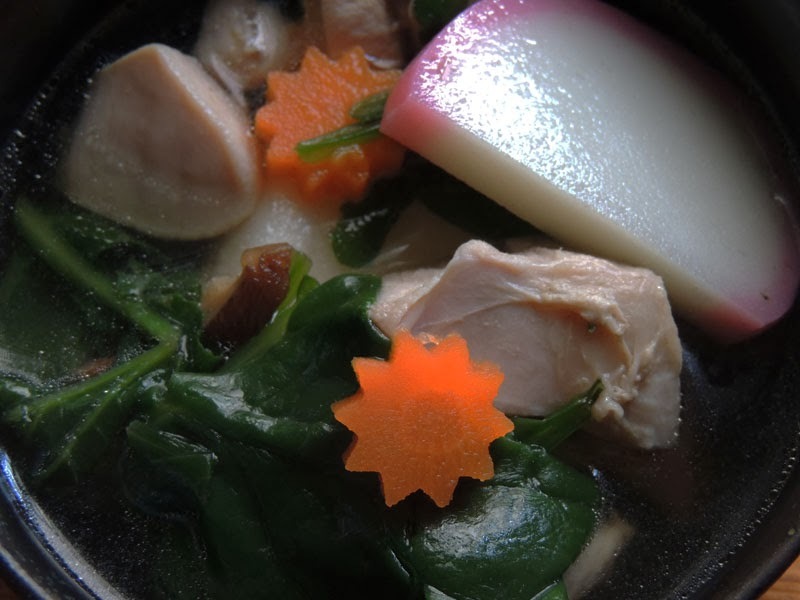 O-zōni (or just zōni, as it is sometimes called), is a simple soup of clear broth, vegetables, and most importantly, mochi, or, rice cakes. There are many variations of this soup by region in Japan, and the ingredients can vary depending on what is available to you. (For example, my part-Japanese half-sister, who lives in Hawai’i, likes to put knots of kombu in her soup since it’s widely available there.) Not only is it a soup for good luck for the New Year, but it is also perfect for those with sensitive tummies after a night of too much indulgence! About an hour before you prepare your Ozoni, put 1 cup of water in a bowl along with the dried shiitake mushrooms. Put the chicken in a colander. Boil a kettle of water and pour it over the chicken, letting the water go down the drain. This removes blood and impurities from the meat, giving you a clear soup. Put the chicken in a pot along with the remaining 4 cups of water, the carrots, sake, and salt, and then simmer for 20 minutes, skimming to remove any scum that rises to the top. Remove the chicken and set it aside. Add the soy sauce, along with the soaking liquid from the shiitake mushrooms to the soup and then adjust salt to taste. Slice up the shiitake mushrooms and add them to the soup. Lay down a sheet of aluminum foil in a toaster oven then toast the mochi until it inflates and turns golden brown along the top. To serve, place piece of grilled mochi at the bottom of the bowl, then add a few slices of chicken. Add the soup along with some spinach, slices of carrot, a couple of slices of kamaboko, and some shiitake mushrooms.